cakelava: The Champ is Here! Rick gave this sculpted baby shower cake a one-two punch. The baby's father was a boxer/martial artist, and his grandfather was also a boxer. The couple had selected the name "Knox" for their child. It was all perfect. 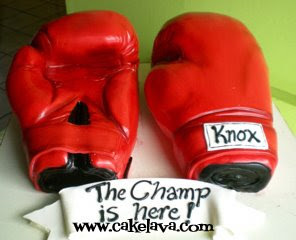 Perfectly appropriate name, fun cake and the writing "The Champ is here!" made this themed cake a real knock-out!